I’m here to prove to you fine people that you CAN decorate a room on a budget – and you REALLY can if you’re patient enough to wait until you find just the right thing at yard sales. Case in point: my desk and chair for the new office cost a total of $9. TOTAL. 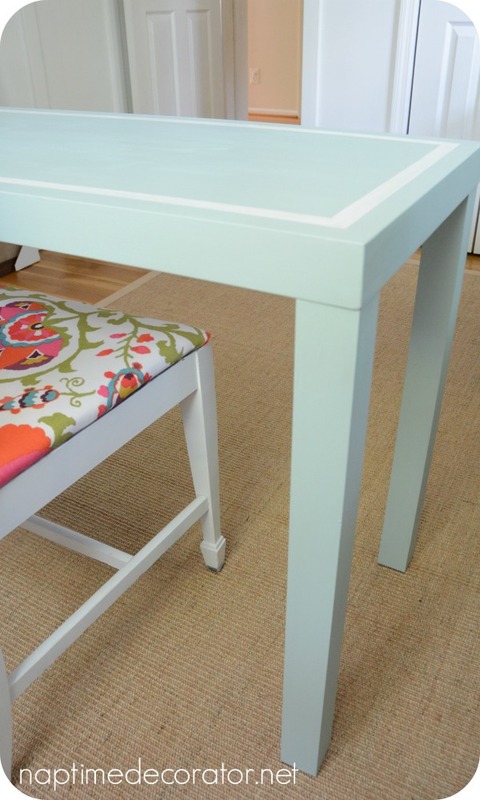 Add the sample of paint and tiny bit of fabric to cover the seat and it was a whopping $17. For a TABLE AND CHAIR. You might remember the chair she got for me a while back, and I put it in our bedroom at the time? She spent $4 for the chair. I used an old sweater to cover the seat, and spray painted it white. You can check it all out here. Well, I needed a chair for the office, and it really served no purpose in my bedroom other than being pretty to look at. So, in typical “shop my home” fashion, I picked up some lovely fabric from Hobby Lobby one day recently and I’m totally in love with it. So let’s recap: $4 for the chair, about $4 for the fabric. She found a $5 desk. FIVE. DOLLARS. Check it out. I had just bought a sample of Sherwin Williams Watery, for my daughter’s room. I thought it might just be THE perfect color for this desk, and it SO was. I didn’t feel like sanding or priming or, well, really any added work, so I added just a small spoonful of Plaster of Paris to it so it would stick to the desk as is (LOVE that trick!) and this $5 desk was looking purdy. 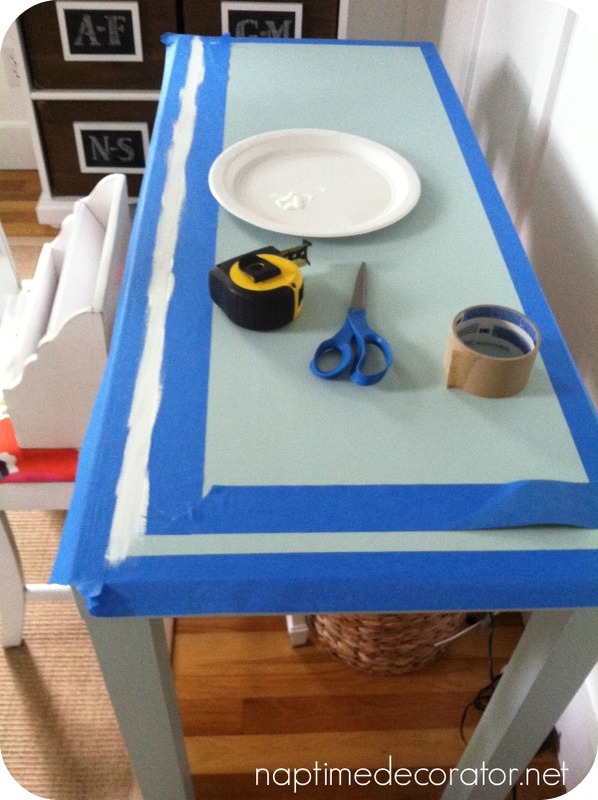 And can I just say – there is NOTHING worse than running out of painter’s tape SMACK dab in the middle of a project?!! I was so desperate that I reused the existing pieces on the sides that ran out! Worked fine, in case that ever happens to you. 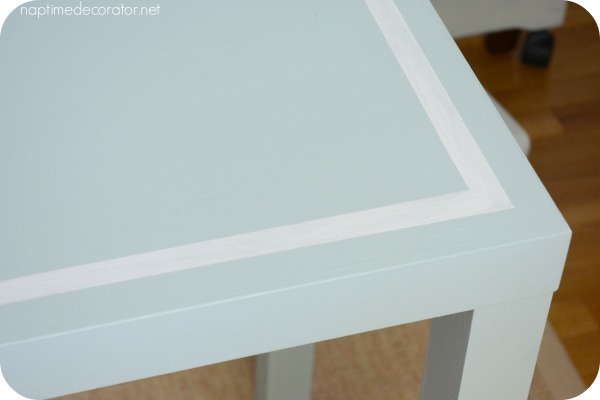 I ripped the tape off, let it dry, then waxed it with Minwax to protect it…and voila! Meet my yard sale beauties! Is that paint color the dreamiest or WHAT?!! And can we talk about that fabric for a second?! Reminds me of something my grandmother had on her couch back in the day, but with an updated colorful twist? I big fat LOVE it. 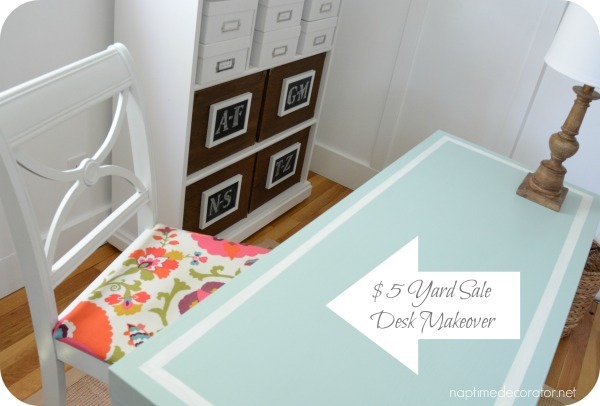 To recap: $5 desk, plus a sample of paint (bought on sale) = $9. What a deal only 9.00! Love it! Love it! And yes, it is the dreamiest color! It is inspiring. LOVE iT!! 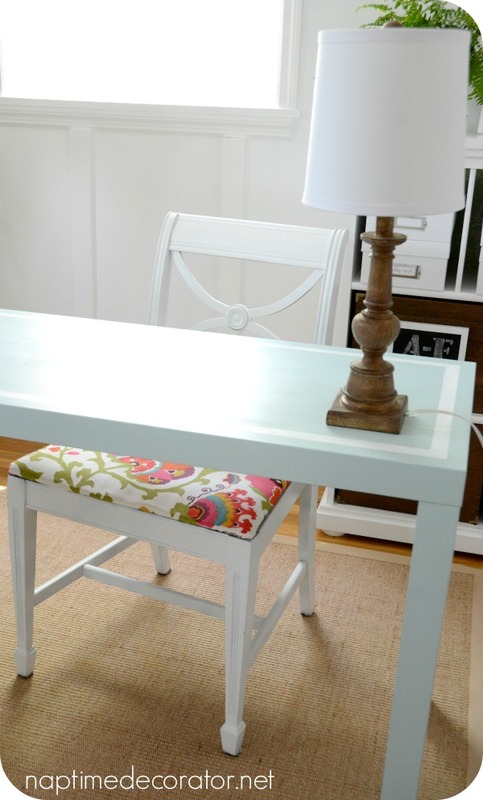 Love the furniture and the idea of shopping your home first! I need to paint a desk white for my office space. 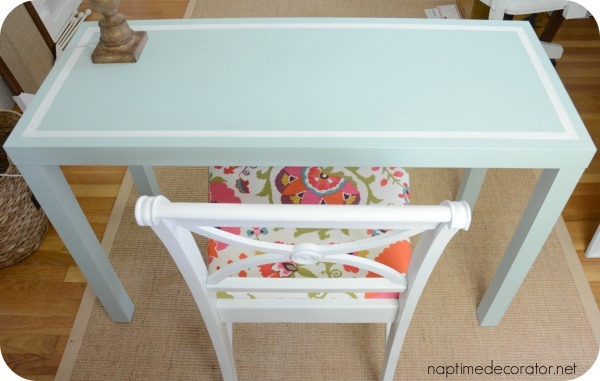 Did you use a roller or a brush to paint your desk? Thanks, Carolyn! I used a brush. Looks beautiful!!! I too was wondering if you used a roller or a brush? Thanks, Amy! I used a brush. Looks great! Which minwax do you use – a spray poly, paint on varnish, or a solid wax rubbed on? I looked at Lowe’s and there were so many to pick from I had no clue what would work best over paint? So beautiful! 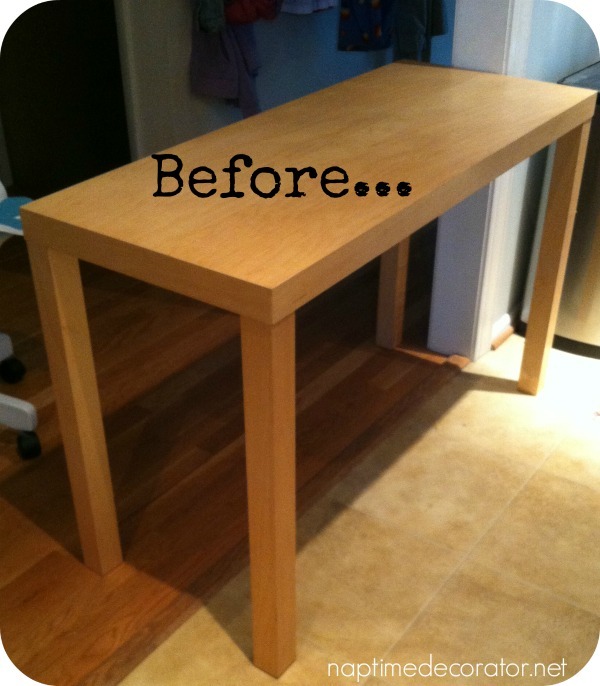 Your painting projects always turn out so flawless! I can never seem to make mine look as good as yours! Lol…. GOOD JOB!